The snow fell around us, pivoting left and right with the constant, heavy wind pushing itself along the ridge. 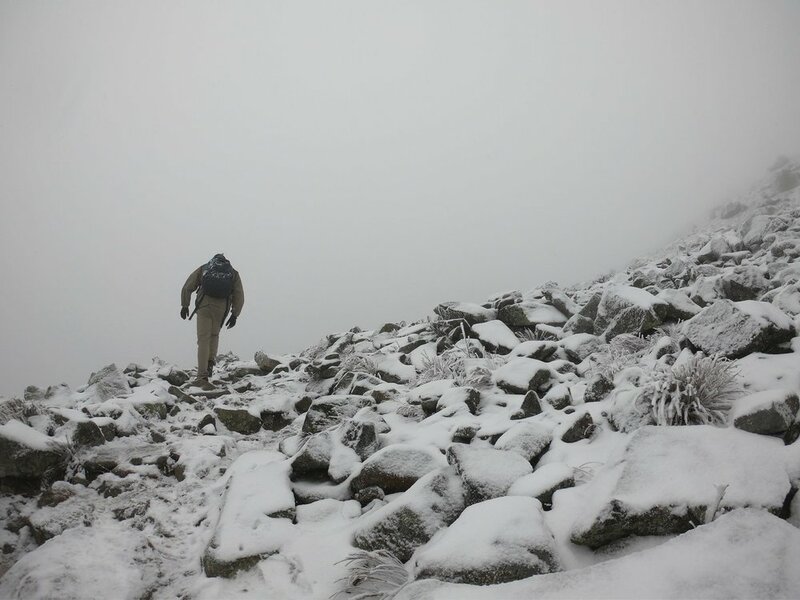 Though not high in altitude, the bitter conditions of the White Mountains impose themselves upon anyone physically and mentally fit enough to explore the region in the later months. 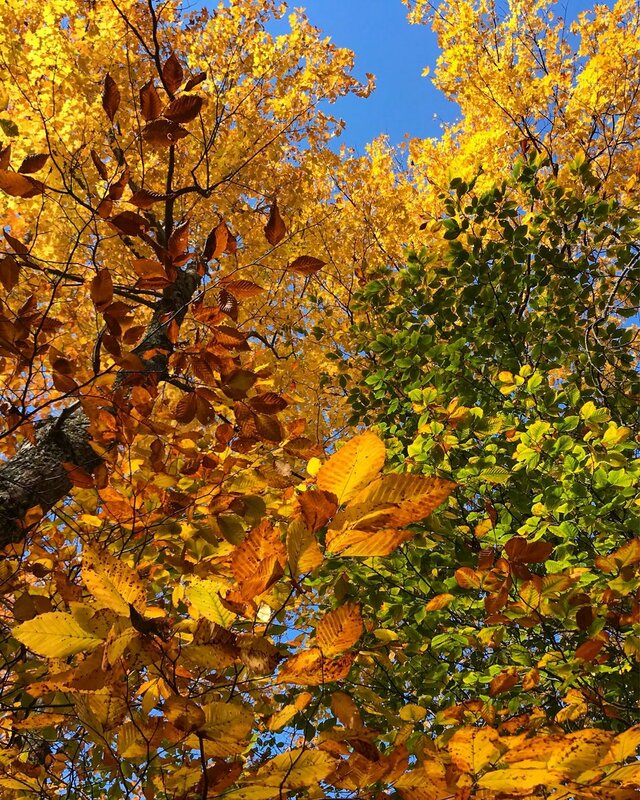 Yet, reward was everywhere: the trees that dawned yellow, red, and orange leaves at the base of the mountain, the lightly sprinkled tips of evergreens standing along the trail, and the icy, snow packed rock piles that signaled a nearing summit. Even after spending portions of my childhood exploring the Northeast, a New Hampshire Fall was a foreign concept to me. On the worst of days, it seemed to be a rainy environment, the colorful hues of the trees dampened by the grey skies above, only to be woken with a spirit and mindset of locals that hinted towards warm fires, afternoon naps, and hearty meals. On the best of days, the sun emanated warmth with each descending ray, causing each falling leaf to dance its yellow, red, and orange colors across the sky and through the breeze to the ground below the tramping footsteps of hikers. We managed to get the best and the worst of days across the period of 120 hours. Whereas in many regions people talk of the beauty nature has to offer, New Hampshirites live it. Snow, rain, and sun all boil down to the same end game: outdoor adventure. For two months, we had been planning to complete the Presidential Traverse, a continuous trail that winds it way peak to peak within the White Mountains, covering a total of 23 miles across 9,000 ft elevation gain. Heavy storm conditions flared up in the final days before we headed out to New Hampshire, warning of strong winds, endless snow, and low visibility. After talking to a local who had completed it the prior week, we were forced to understand that it was time to research and plan out an alternative route, as we had not been expecting to camp and trek through the fourth season’s power on one of the United States’ notorious and most dangerous winter trails. 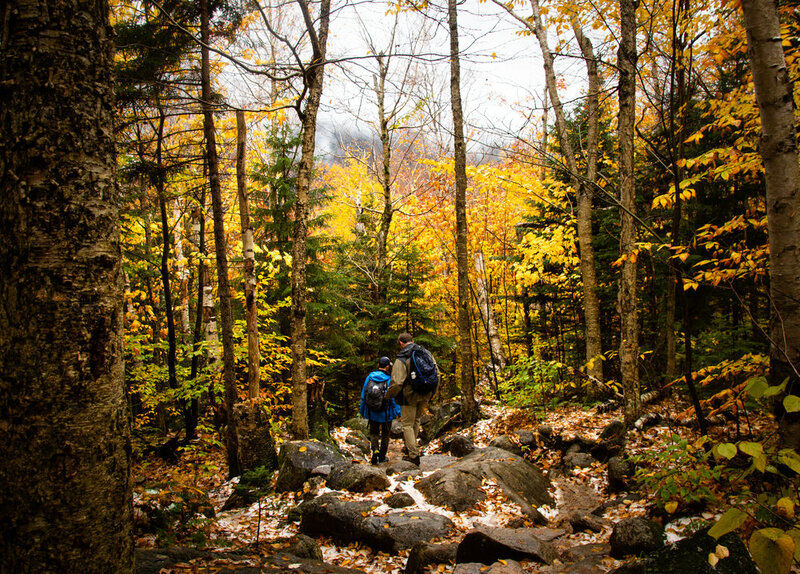 Rather than take the risk with limited equipment and time, we selected the Franconia Ridge Loop Trail and arrived at an extremely sunny valley Notch dressed in the oranges, yellows, and reds of a Northeast Fall season. As we made our way up the trail, the Fall colors slowly faded away, turning into a quiet and peaceful Winter landscape. Pine trees frosted with fresh snow banked along the trail, while ice turned the rocks we stepped across into slippery obstacles. After gaining only 1,500 feet, the clear skies gave way to snow, reminding us of the quickly changing conditions the area often faced. Soon enough, the snow came pouring down and the evergreens were replaced by low vegetation and piles of snow all around. It was as if we had stepped into an entirely different world by simply following one trail. The summit of Mt. Lafayette boasted views and visibility of 45 feet, at best, yet we were nothing but smiles with the refreshing, powerful winds pounding our faces. While it wasn’t the trek we had envisioned, we felt lucky to have experienced both the sunny, Fall valley below us and the cold signs of Winter at the summit. It must have snowed our entire trip back down the mountain, from the frozen alpine state of the summit to the vegetated wonderland of the notch. Faces tight from the cold and legs slightly aching from the journey, we settled into our campsite for a night of conversation, trail grub, and bourbon. As our voices dwindled, our fire burned the greases of a successful dinner, and the bottle lay empty by the collected woodpile, all that remained was a calling to that which is greater than ourselves. Eyes fixated on the constellations that danced across the sky, our four minds came together to realize how small our place in the universe is and how lucky we were to be in New Hampshire on a brisk Fall night, just four sets of eyes and the entire universe. Big thanks to Basecamper and New Hampshire native Evan Ruderman for showing off his home state with nothing but respect, appreciation, and pure stoke. There really is nothing quite like a North East autumn and the rest of the team was in awe of what it had to offer. Cheers!